Within a span of 48-hours, the corpse plant went from a sealed plant (left) to a fully-opened pollination machine. If you passed by the campus greenhouse over the weekend you may have noticed a wretched scent of rotting flesh. Fear not, it was only the blooming of Racine, the campus corpse plant. 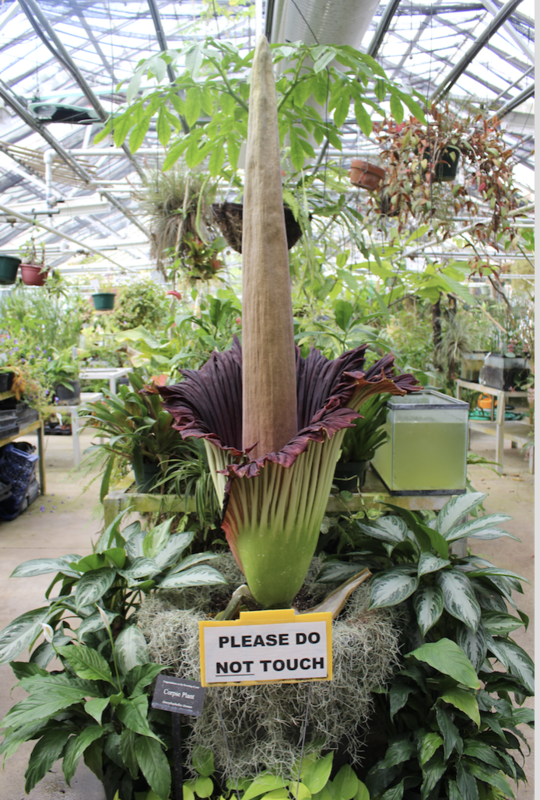 Usually corpse plants, or Amorphophallus titanums, bloom only once every 10 years, but Rollins’ has bloomed again, less than three years since it first produced a flower in April 2015. The corpse plant at Rollins is known as Racine. “When I repotted her last month the corm [a modified stem] weighed only 19 pounds,” said Alan Chryst, the greenhouse manager of more than 20 years. “When she bloomed the first time the corm weighed 28 pounds,” Chryst said. Corms are swollen underground plant stems that store food so plants can survive adverse conditions. Racine only remained open for about 12 to 36 hours after it first bloomed, with her peak stench occuring in the early morning hours of Monday, Sept. 3. Corpse plants only produce one leaf per year. While the leaves grow, energy is stored in the corm to build up for a bloom. “I didn’t think a 19 pound corm had enough energy to produce a flower,” says Chryst, who has read about plants that bloom when the corm weighs 100 or even 200 pounds once the flower is produced. While the circumstances are extraordinary, Chryst does have some concerns for the plant’s safety. He fears that Racine will not have enough energy to produce another leaf after blooming again so soon, which could cause it to die. Dr. Paul Stephenson, associate professor of biology at Rollins, said that there is not much information on why the plant may be blooming again so soon. However, he does not see any need for concern. “Our corpse plant had a smaller than average corm when it first bloomed and seems to be continuing this trend,” he said. 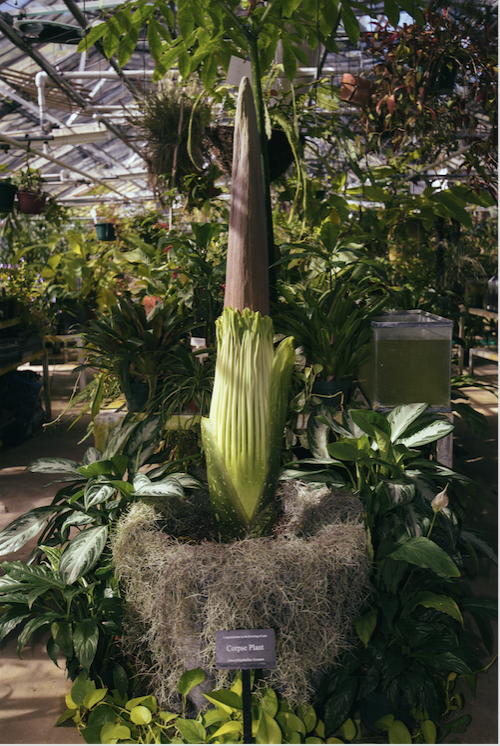 Stephenson also noted one case of a corpse plant blooming three times in six years at the University of Wisconsin. The first human-assisted bloom of the corpse plant was in 1889 at Kew Gardens in London, and since then only 200 or so cultivated plants have bloomed around the world. Each blooming captures the public’s fascination, and because of its rarity, thousands of people travel to the Rollins greenhouse to experience the spectacle and rotting stench. Before it bloomed, the plant was 61 inches tall, which is taller than it was during its initial blooming.